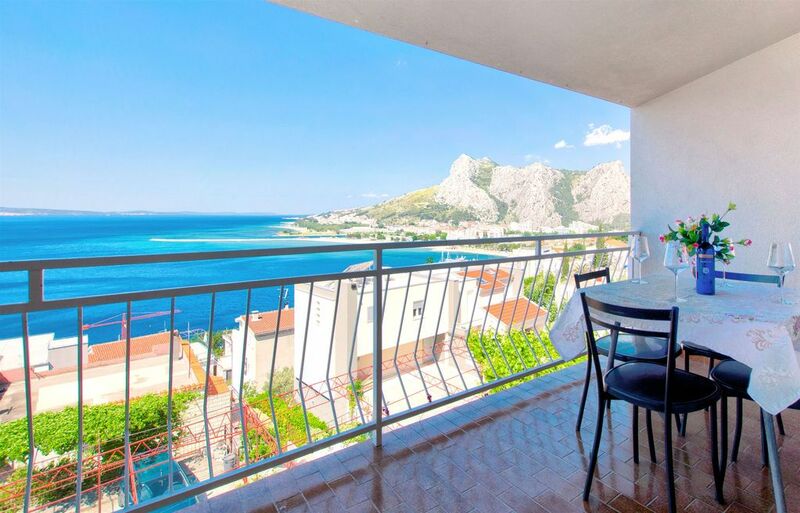 In the city of Omiš, known for its beautiful sandy and pebble beaches, apartments Tomislav are located. Only 30 km away from the famous tourist destination, the city of Split, these apartments offer you a chance for a relaxing holiday full of interesting events. Swim on the beautiful sandy beach just a few-minute walk away. Apart from this popular beach, not far from the apartment there is also a number of lesser known pebble beaches. In this facility you can choose between two apartments for four persons. Both are on the second floor of the house, with spacious balconies with a beautiful sea view. The apartments are equipped with one double bed in the bedroom and an extra bed for two in the living room. The kitchen in both apartments is equipped with everything you need for an unforgettable stay. The bathroom in each apartment has a shower, and Internet is free of charge as well as air conditioning. Air conditioning is available in the living room, in both apartments. In front of the house there is a barbecue, which you, as well as other guests of the facility, can use. Make sure to ask for tips about recipes on the grill from a friendly host who is always ready to help. In front of the object there is a parking place for the guests of the apartment. If you can not imagine your vacation without your pet, here it is welcome, only with a prior announcement to the agency and free of charge.Walk with your loved ones to the center of Omiš, which is only 600 m away, visit the beautiful old city core and the fortresses Mirabela and Fortica. If you are looking for an active vacation, go on a rafting adventure on the Cetina River, whose mouth is in the town of Omis, or experience an unforgettable zip line ride through the river canyon. Be sure to visit the nearby town of Split, the famous tourist center and the largest town of Dalmatia. Visit numerous cultural and historical monuments, such as Diocletian's Palace, the monument of Gregory of Nin and others. Omiš is the right destination for your vacation? Tomislav is the name of this object, located in Omiš. This object is 190 m of air distance away from the sea. During the summer days, look for refreshments for yourself and your family on the beach that is 270 m away from the object. The beach is: pebble beach. To stay on the beach, make sure that you bring towels and protect yourself from the sun with a hat or sunshade, and use a protective cream. Tomislav has a secured parking, which is another advantage of this accommodation, and is of crucial importance if you travel by car on your vacation. During your vacation, most people love to prepare fish or meat on the grill for dinner or lunch. And after dinner enjoy the night in a pleasant company. The object "Tomislav" has Grill, so if you like barbecues then you will definitely enjoy staying in this object. If you are traveling with a pet then you will be positively surprised because this facility has the option of accepting pets. Pet friendly accommodation - only by prior arrangement with the agency. Any additional questions related to the beach or destination Omiš please check with your host because they still know best the location. We wish you a warm welcome to our facility Tomislav in destination Omiš. Accommodation Tomislav is located 190 m from the sea, 600 m from the center in the town Omiš. This accommodation offers a view of the Sea. Type of beach pebble beach. Private accommodation Tomislav is ideal for 4 persons and has 1 rooms in the accommodation. Accommodation is equipped with: Heating, Air conditioning, Television, Internet, Iron. To make the hot summer days more bearable in the accommodation there is an Air conditioning. Pet friendly accommodation - only by prior arrangement with the agency. Airline distance to the sea: 190 m.
A kilátás fantasztikus volt, a szállás jó helyen van, ha van autója az embernek.